Dmitry Anatolyevich Medvedev (/mɪdˈvɛdɪf/; Russian: Дми́трий Анато́льевич Медве́дев, IPA: [ˈdʲmʲitrʲɪj ɐnɐˈtolʲjɪvʲɪtɕ mʲɪdˈvʲedʲɪf]; born 14 September 1965) is a Russian politician who has served as the Prime Minister of Russia since 2012. From 2008 to 2012, Medvedev served as the third President of Russia. Dmitry Medvedev was born on 14 September 1965 in Leningrad, in the Soviet Union. His father, Anatoly Afanasyevich Medvedev (November 1926 – 2004), was a chemical engineer teaching at the Leningrad State Institute of Technology. Dmitry's mother, Yulia Veniaminovna Medvedeva (née Shaposhnikova, born 21 November 1939), studied languages at Voronezh University and taught Russian at Herzen State Pedagogical University. Later, she would also work as a tour guide at Pavlovsk Palace. 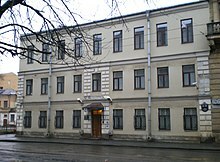 The Medvedevs lived in a 40 m² apartment at 6 Bela Kun Street in the Kupchino Municipal Okrug (district) of Leningrad. Dmitry was his parents' only child. The Medvedevs were regarded as Soviet intelligentsia family of the time. His maternal grandparents were Ukrainians, whose surname was Kovalev, originally Koval. Medvedev traces his family roots to the Belgorod region. As a child, Medvedev was bookish and studious, described by his first grade teacher Vera Smirnova as a "dreadful why-asker". After school, he would spend some time playing with his friends before hurrying home to work on his assignments. In the third grade, Medvedev studied the ten-volume Small Soviet Encyclopedia belonging to his father. In the second and third grades, he showed interest in dinosaurs and memorized primary Earth's geologic development periods, from the Archean up to the Cenozoic. In the fourth and fifth grades, he demonstrated interest in chemistry, conducting elementary experiments. He was involved to some degree with sport. In grade seven, adolescent curiosity blossomed through Svetlana Linnik, his future wife, studying at the same school in a parallel class. The relationship apparently affected Medvedev's school performance. Medvedev calls the school's final exams in 1982 a "tough period when I had to mobilize my abilities to the utmost for the first time in my life." In the autumn of 1982, 17-year-old Medvedev enrolled at Leningrad State University to study law. Although he also considered studying linguistics Medvedev later said he never regretted his choice, finding his chosen subject increasingly fascinating, stating that he was lucky "to have chosen a field that genuinely interested him and that it was really 'his thing". Fellow students described Medvedev as a correct and diplomatic person who in debates presented his arguments firmly, without offending. After Sobchak's election campaign Medvedev continued his academic career in the position of docent at his alma mater, now renamed Saint Petersburg State University. He taught civil and Roman law until 1999. According to one student, Medvedev was a popular teacher; "strict but not harsh". During his tenure Medvedev co-wrote a popular three-volume civil law textbook which over the years has sold a million copies. Medvedev also worked at a small law consultancy firm which he had founded with his friends Anton Ivanov and Ilya Yeliseyev, to supplement his academic salary. As President, Putin launched a campaign against corrupt oligarchs and economic mismanagement. He appointed Medvedev Chairman of gas company Gazprom's board of directors in 2000 with Alexei Miller. Medvedev put an end to the large-scale tax evasion and asset stripping by the previous corrupt management. Medvedev then served as deputy chair from 2001 to 2002, becoming chair for the second time in June 2002, a position which he held until his ascension to Presidency in 2008. During Medvedev's tenure, Gazprom's debts were restructured and the company's market capitalisation grew from $7.8 billion in 2000 to $300 billion in early 2008. In December 2007, in preparation for his election campaign, Medvedev announced that funding of the National Priority Projects would be raised by 260 billion rubles for 2008. Medvedev's election campaign was relatively low-key and, like his predecessor, Medvedev refused to take part in televised debates, citing his high workload as first deputy prime minister as the reason. Instead, Medvedev preferred to present his views on his election website Medvedev2008.ru. Freedom is better than non-freedom – this principle should be at the core of our politics. I mean freedom in all its manifestations – personal freedom, economic freedom and, finally, freedom of expression. I believe my most important aims will be to protect civil and economic freedoms... We must fight for a true respect of the law and overcome legal nihilism, which seriously hampers modern development. His inauguration coincided with the celebration of the Victory Day on 9 May. He attended the military parade at Red Square and signed a decree to provide housing to war veterans. 12 May 2008, Putin proposed the list of names for his new cabinet which Medvedev approved. Most of the personnel remained unchanged from the times of Putin's presidency but there were several high-profile changes. The Minister of Justice, Vladimir Ustinov was replaced by Aleksandr Konovalov; the Minister of Energy, Viktor Khristenko was replaced with Sergei Shmatko; the Minister of Communications, Leonid Reiman was replaced with Igor Shchyogolev and Vitaliy Mutko received the newly created position of Minister of Sports, Tourism and Youth policy. Medvedev was careful not to upset the balance of different factions in the Presidential administration and in the government. However, the influence of the powerful security/military-related siloviki weakened after Medvedev's inauguration for the first time in 20 years. In their place, Medvedev brought in the so-called civiliki, a network of St. Petersburg civil law scholars preferred by Medvedev for high positions. From the beginning of Medvedev's tenure, the nature of his Presidency and his relationship with Vladimir Putin was subject to considerable media speculation. In a unique situation in the Russian Federation's political history, the constitutionally powerful President was now flanked with a highly influential Prime Minister (Putin), who also remained the country's most popular politician. Previous Prime Ministers had proven to be almost completely subordinate to the President and none of them had enjoyed strong public approval, with Yevgeny Primakov and Putin's previous tenure (1999–2000) as Prime Minister under Boris Yeltsin being the only exceptions. Journalists quickly dubbed the new system with a practically dual-headed executive as "government by tandem" or "tandemocracy", with Medvedev and Putin called the "ruling tandem". The long-lingering conflict between Georgia and the separatist regions of South Ossetia and Abkhazia, which were supported by Russia, escalated during the summer of 2008. In the night of 7–8 August, Georgia launched a military operation in South Ossetia with 10,000–11,000 soldiers and 75 tanks. Several Russian peacekeepers were killed in the fighting, and many South Ossetians who had Russian citizenship. Shortly in the aftermath of the conflict, Medvedev formulated a 5-point strategy of the Russian foreign policy, which has become known as the Medvedev Doctrine. On 30 September 2009, the European Union–sponsored Independent International Fact-Finding Mission on the Conflict in Georgia stated that, while preceded by months of mutual provocations, "open hostilities began with a large-scale Georgian military operation against the town of Tskhinvali and the surrounding areas, launched in the night of 7 to 8 August 2008." Medvedev made reforming Russia's law enforcement one of his top agendas, the reason for which was a shooting started by a police officer in April 2009 in one of Moscow's supermarkets. Medvedev initiated the reform at the end of 2009, with a presidential decree issued on 24 December ordering the government to start planning the reform. In early August 2010 a draft law was posted on the Internet at the address http://www.zakonoproekt2010.ru for public discussion. The website was popular, with more than 2,000 comments posted within 24 hours of its opening. Based on citizen feedback, several modifications to the draft were made. On 27 October 2010, President Medvedev submitted the draft to the lower house of the Russian parliament, the State Duma. The State Duma voted to approve the bill on 28 January 2011, and the upper house, the Federation Council followed suit on 2 February 2011. On 7 February 2011, President Medvedev signed the bill into law. The changes came into effect on 1 March 2011. Under the reform, the salaries of Russian police officers were increased by 30%, Interior Ministry personnel were cut and financing and jurisdiction over the police weree centralised. Around 217 billion rubles ($7 billion) were allocated to the police reform from the federal budget for the time frame 2012–2013. 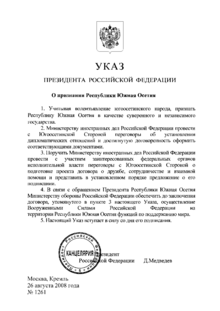 On 4 May 2011, Medvedev signed the Federal Law On Amendments to the Criminal Code and the Code of Administrative Offences of the Russian Federation to Improve State Anti-Corruption Management. The bill raised fines for corruption to up to 100 times the amount of the bribe given or received, with the maximum fine being 500 million rubles ($18.3 million). President Medvedev initiated a new policy called "Our New School"[clarification needed] and instructed the government to present a review on the implementation of the initiative every year. In May 2009, Medvedev set up the Presidential Commission of the Russian Federation to Counter Attempts to Falsify History to the Detriment of Russia's Interests. In August of the same year, he stated that he opposes the equating of Stalinism with Nazism. Medvedev denied the involvement of the Soviet Union in the Soviet invasion of Poland together with Nazi Germany. Arguments of the European Union and of the OSCE were called a lie. Medvedev said it was Joseph Stalin who in fact "ultimately saved Europe". On 30 October 2009, due to the Day of Remembrance of the Victims of Political Repressions, President Medvedev published a statement in his video blog. He stressed that the memory of national tragedies is as sacred as the memory of victory. Medvedev recalled that for twenty of the pre-war years entire layers and classes of the Russian people were destroyed (this period includes the Red Terror mainly under the lead of Felix Dzerzhinsky, the crimes of Joseph Stalin and other evil deeds of the Soviet Bolsheviks). Nothing can take precedence over the value of human life, said the President. In August 2014, President Barack Obama said: "We had a very productive relationship with President Medvedev. We got a lot of things done that we needed to get done." During the official visit to Armenia, 7 April 2016 year, Prime Minister Dmitry Medvedev visited the Tsitsernakaberd Memorial Complex to pay tribute to the victims of the Armenian Genocide. Medvedev laid flowers at the Eternal Fire and honored the memory of the victims with a minute of silence. Russia recognized the crime yet in 1995 year. On 24 September 2011, while speaking at the United Russia party congress, Medvedev announced that he would recommend the party nominate Vladimir Putin as its presidential candidate and that the two men had long ago cut a deal to allow Mr. Putin to return to the presidency in 2012 after he was forced to stand down in 2008 by term limits. This switch was termed by many in the media as "rokirovka", the Russian term for the chess move "castling". Medvedev said he himself would be ready to perform "practical work in the government". Putin accepted Medvedev's offer the same day, and backed him for the position of the Prime Minister of Russia in case the United Russia, whose list of candidates in the elections Medvedev agreed to head, were to win in the upcoming Russian legislative election. The same day the Russian Orthodox Church endorsed the proposal by President Medvedev to let Putin return to the post of President of Russia. On 22 December 2011, in his last state of the nation address in Moscow, Medvedev called for comprehensive reform of Russia's political system — including restoring the election of regional governors and allowing half the seats in the State Duma to be directly elected in the regions. "I want to say that I hear those who talk about the need for change, and understand them", Medvedev said in an address to the Duma. "We need to give all active citizens the legal chance to participate in political life." However, the opposition to the ruling United Russia party of Medvedev and Prime Minister Putin dismissed the proposals as political posturing that failed to adequately address protesters who claimed 4 December election was rigged. On 7 May, on his last day in office, Medvedev signed the last documents as the head of state: in the sphere of civil society, protection of human rights and modernization. He approved the list of instructions by the results of the meeting with the Presidential council on Civil Society and Human Rights, which was held on 28 April. Medvedev also approved with his decree "Presidential programme for raising skills of engineers for 2012–2014" for modernization and technological development of the Russian economy. 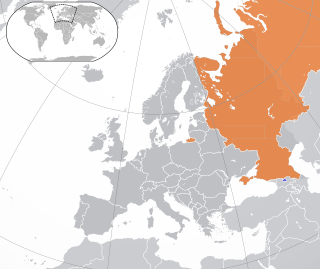 In the wake of the 2014 Ukrainian revolution, Russia annexed the Crimean Peninsula. On 31 March 2014, Medvedev was the first Russian leader to visit Crimea since the peninsula became part of Russia on 18 March. During his visit he announced the formation of the Federal Ministry for Crimea Affairs. On 7 May 2018, Vladimir Putin again nominated Dmitry Medvedev as Prime Minister. On 8 May, Medvedev was confirmed by the State Duma as Prime Minister, with 374 votes in favor. On 15 May, Putin approved the structure and on 18 May the composition of the Cabinet. Medvedev is a fan of British hard rock, listing Led Zeppelin, Black Sabbath, Pink Floyd, and Deep Purple as his favorite bands. He is a collector of their original vinyl records and has previously said that he has collected all of the recordings of Deep Purple. As a youth, he made copies of their records, even though these bands were then on the official state-issued blacklist. 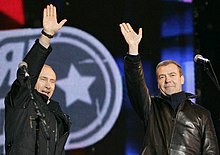 In February 2008, Medvedev and Sergei Ivanov attended a Deep Purple concert in Moscow together. Medvedev always reserves an hour each morning and again each evening to swim and weight train. He swims 1,500 metres (4,900 ft) twice a day. He also jogs, plays chess, and practices yoga. Among his hobbies are reading the works of Mikhail Bulgakov and he is also a fan of the Harry Potter series after asking J. K. Rowling for her autograph when they met during the G-20 London Summit in April 2009. He is also a fan of football and follows his hometown professional football team, FC Zenit Saint Petersburg. Medvedev's reported 2007 annual income was $80,000, and he reported approximately the same amount as bank savings. Medvedev's wife reported no savings or income. They live in an upscale apartment house "Zolotye Klyuchi" in Moscow. Despite this supposedly modest income, a video by anti-corruption activist Alexei Navalny purports to show "the vast trove of mansions, villas and vineyards accumulated" by Medvedev. On the Russian-language Internet, Medvedev is sometimes associated with the Medved meme, linked to padonki slang, which resulted in many ironic and satirical writings and cartoons that blend Medvedev with a bear. (The word medved means "bear" in Russian and the surname "Medvedev" is a patronymic which means "of the bears".) Medvedev is familiar with this phenomenon and takes no offense, stating that the web meme has the right to exist. Medvedev speaks English, in addition to his native Russian, but during interviews he speaks only Russian. Medvedev initiated a few anti-corruption laws in Russia, and has been a vocal corruption opponent in Russia who often pointed to corruption as one of the main challenges of Russia. In September 2016, Alexei Navalny published a report with information about Dmitry Medvedev's alleged summer residence ("dacha") – an 80 hectare estate with plethora of houses, a ski run, a cascading swimming pool, three helipads and purpose-built communications towers. The estate even includes a house for ducks, which received public ridicule and led to ducks becoming a protest symbol in Russia a year later. The area is surrounded by a six-foot (1.82 meter) fence and is allegedly 30 times the size of Red Square, the iconic square in Moscow. This summer residence is an expensively renovated 18th century manor called Milovka Estate [ru] and located in Plyos on the shore of Volga River. In March 2017, Navalny and the Anti-corruption Foundation published another in-depth investigation of properties and residences used by Medvedev and his family. A report called He Is Not Dimon To You shows how Medvedev allegedly owns and controls large areas of land, villas, palaces, yachts, expensive apartments, wineries and estates through complicated ownership structures involving shell companies and foundations. Their total value is estimated at around 1.2 billion USD. The report states that the original source of wealth is gifts by Russian oligarchs and loans from state owned banks. An hour long YouTube video in Russian was released together with the report. A month after release, the video had more than 24 million views. Medvedev dismissed the allegations, calling them "nonsense". These revelations have resulted in large protests throughout Russia. Russian authorities responded by arresting protesters in unauthorised protests—hundreds were arrested including Alexei Navalny, which the government called "an illegal provocation". An April 2017 Levada poll found that 45% of surveyed Russians supported the resignation of Medvedev. In October 2008, President Medvedev began posting a videoblog at the presidential website. His videoblog posts have also been posted in the official LiveJournal community blog_medvedev since 21 April 2009 by the Kremlin administration. On 23 June 2011, Medvedev participated in launching of the "Eternal Values" project of RIA Novosti state-operated news agency together with Russian Chapter of Wikimedia Foundation. 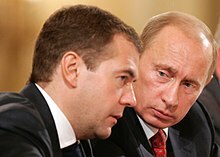 RIA Novosti granted free Creative Commons licenses to a one hundred of its images, while Medvedev registered as Dmitry Medvedev for RIAN and personally uploaded one of those photographs to Wikimedia Commons. ^ Medvedev becomes Russia's PM: Voice of Russia Archived 12 May 2013 at the Wayback Machine. The Voice of Russia (8 May 2012). Retrieved 10 May 2012. ^ "Transcript interview, First Deputy Chairman of the Government of the Russian Federation Dmitry Medvedev" (in Russian). Government of the Russian Federation. 24 January 2008. Archived from the original on 6 July 2013. Retrieved 26 July 2008. ^ a b c d e f "Dmitry Medvedev: Biography". Kremlin.ru. 2008. Archived from the original on 25 March 2011. ^ "Ukrainian media interviews President Medvedev". Russia Today. Archived from the original on 18 May 2010. Retrieved 16 May 2010. ^ Andreyev, Sergey. "Почему Медведев?". Archived from the original on 11 August 2010. ^ Umland, Andreas (11 December 2007). "The Democratic Roots of Putin's Choice". Washington Post. Galina Kozhevnikova and Vladimir Pribylovskii Rossiiskaia vlast' v biografiiakh I: Vysshie dolzhnostnye litsa RF v 2004 g. Stuttgart: ibidem-Verlag, 2007, p. 117. Retrieved 10 May 2008. ^ a b c d e f Willerton, John (2010). "Semi-presidentialism and the evolving executive". In White, Stephen (ed.). Developments in Russian Politics. 7. Duke University Press. ISBN 9780230224490. ^ United Russia endorses D Medvedev as candidate for presidency Archived 4 March 2008 at the Wayback Machine ITAR-TASS, 17 December 2007. ^ (in Russian) О регистрации Дмитрия Анатольевича Медведева кандидатом на должность Президента Российской Федерации Archived 5 March 2008 at the Wayback Machine, Decision No. 88/688-5 of the Central Election Commission of the Russian Federation, 21 January 2008. ^ Putin's Chosen Successor, Medevedev, Starts Campaign (Update2) Archived 16 January 2008 at the Wayback Machine, Bloomberg.com, 11 January 2008. ^ "Moscow Times". webcache.googleusercontent.com. Archived from the original on 13 August 2008. Retrieved 28 September 2010. ^ Putin's successor dismisses fears of state "grab" Archived 21 January 2008 at the Wayback Machine, Reuters, 17 January 2008. ^ "ABC Live". Abclive.in. Archived from the original on 27 May 2009. Retrieved 28 September 2010. ^ "All the Next President's Men". Russia Profile. 19 December 2007. Archived from the original on 4 August 2011. ^ "EU report, volume II" (PDF). Independent International Fact-Finding Mission on the Conflict in Georgia. 30 September 2009. Archived from the original (PDF) on 6 July 2011. Retrieved 30 September 2009. ^ Nicoll, Alexander; Sarah Johnstone (September 2008). "Russia's rapid reaction". International Institute for Strategic Studies. Archived from the original on 21 October 2008. Retrieved 9 December 2009. ^ Lavrov, Anton (2010). Ruslan Pukhov (ed.). The Tanks of August. Centre for Analysis of Strategies and Technologies. p. 49. ISBN 978-5-9902320-1-3. ^ Statement on the Situation in South Ossetia Archived 16 October 2011 at the Wayback Machine Website of the President of Russia, 8 August 2008. ^ "Georgia 'started unjustified war'". BBC News. 30 September 2009. ^ "EU Report: Independent Experts Blame Georgia for South Ossetia War". Der Spiegel. 21 September 2009. ^ a b Guriev, Sergei; Tsyvinski, Aleh (2010). "Challenges Facing the Russian Economy after the Crisis". In Anders Åslund; Sergei Guriev; Andrew C. Kuchins (eds.). Russia After the Global Economic Crisis. Peterson Institute for International Economics; Centre for Strategic and International Studies; New Economic School. pp. 9–39. ISBN 978-0-88132-497-6. ^ Treisman, Daniel (2010). "Russian Politics in a Time of Turmoil". In Anders Åslund; Sergei Guriev; Andrew C. Kuchins (eds.). Russia After the Global Economic Crisis. Peterson Institute for International Economics; Centre for Strategic and International Studies; New Economic School. pp. 39–59. ISBN 978-0-88132-497-6. ^ "Russia Profile Weekly Experts Panel: 2009 – Russia's Year in Review". Russia Profile. 31 December 2009. Archived from the original on 19 January 2011. ^ Dyomkin, Denis (2010). "Russia tells regions to join privatization drive". Reuters. ^ "Russia Profile Weekly Experts Panel: Medvedev's Quest for Innovation". Russia Profile. 5 June 2009. Archived from the original on 11 August 2010. Retrieved 30 June 2009. ^ "Ъ-Online – Генпрокуратура приступила к проверке госкорпораций". Kommersant.ru. Archived from the original on 10 June 2011. Retrieved 28 September 2010. ^ "Russia Profile Weekly Experts Panel: Will Police Reform Result in Name Change Only?". Russia Profile. 27 August 2010. Archived from the original on 11 July 2011. ^ "Medvedev submits draft police law to Russian lower house". RIA Novosti. 27 October 2010. Archived from the original on 7 October 2011. ^ "Russia to spend around $7 billion on police reform in 2012–2013". RIA Novosti. 9 September 2010. Archived from the original on 7 October 2011. ^ National Anti-Corruption Plan Archived 16 October 2011 at the Wayback Machine Website of the President of Russia, 31 July 2008. 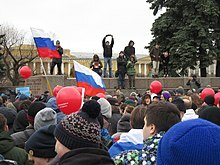 ^ "Medvedev vetoes law restricting protests: Kremlin | Russian News | Expatica Moscow". www.expatica.com. Retrieved 2 September 2015. ^ "Full text in English". Kremlin.ru. Archived from the original on 31 August 2009. Retrieved 28 September 2010. ^ "Burger Time for President's Obama and Medvedev". YouTube.com. The Associated Press, USA. 25 June 2010. Retrieved 8 April 2017. ^ "Burger Time for President's Obama and Medvedev". YouTube.com. Russia Today. 25 June 2010. Retrieved 8 April 2017. ^ "Burger Time for President's Obama and Medvedev". Russia Today. 25 June 2010. Retrieved 8 April 2017. ^ "The Obamas and The Medvedevs Dine Together". YouTube.com. WestEndNews. 13 November 2012. Retrieved 8 April 2017. ^ "The president on dealing with Russia". The Economist. 2 August 2014. ^ a b Osborn, Andrew (7 March 2010). "Dmitry Medvedev's Russia still feels the cold hand of Vladimir Putin, Telegraph". The Daily Telegraph. UK. Retrieved 28 September 2010. ^ "Medvedev insists he's the boss". Television New Zealand. 30 March 2009. Archived from the original on 19 September 2011. Retrieved 28 September 2011. ^ "Russia's Medvedev tries to appease protesters". Archived from the original on 12 January 2012. Retrieved 22 December 2011. ^ (in Russian) "Putin signs first decree as president", Itar Tass, 7 May 2012 Archived 14 June 2013 at the Wayback Machine. Itar-tass.com. Retrieved 10 May 2012. ^ Putin returns as Russia's president amid protests – CNN.com. Edition.cnn.com (7 May 2012). Retrieved 10 May 2012. ^ Putin Proposes Medvedev As Russian Prime Minister. 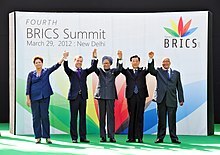 Rttnews.com (7 May 2012). Retrieved 10 May 2012. ^ Putin hands Medvedev prime minister role amidst sustained unrest. The Globe and Mail (8 May 2012). Retrieved 10 May 2012. ^ Medvedev becomes Russia's PM: Voice of Russia Archived 12 May 2013 at the Wayback Machine Retrieved 10 May 2012. ^ "Госдума согласилась на назначение Медведева главой правительства РФ". Интерфакс (in Russian). Retrieved 8 May 2018. ^ "Указ "О структуре федеральных органов исполнительной власти"". Kremlin.ru (in Russian). Retrieved 15 May 2018. ^ "Президент подписал указы о составе нового Правительства". Kremlin.ru (in Russian). Retrieved 18 May 2018. ^ Medvedev Will Run Russia to Tune of Hard-Rock Band Deep Purple Archived 8 September 2008 at the Wayback Machine. Retrieved 8 March 2008. ^ "Russian President Harry Potter fan, asks for Rowling's autograph". Mosnews. Archived from the original on 26 May 2010. Retrieved 28 September 2010. ^ Nicholas II, FC Zenit, Black Sabbath – Medvedev's favorite things Archived 4 March 2008 at the Wayback Machine, ITAR-TASS, 11 December 2007. ^ "Он вам не Димон". YouTube. ^ Diehl, Jackson (19 March 2017). "For this Russian dissident, holding Putin accountable was almost deadly — twice". Washington Post. ^ A Soft-Spoken, 'Smart-Kid' Lawyer Archived 22 November 2008 at the Wayback Machine, The Moscow Times, 2 November 2007. ^ (in Russian) Дмитрий Медведев: учите олбанский!, Lenta.ru, 5 March 2007. ^ (in Russian) Превед, Медвед, Polit.ru, 18 December 2007. ^ "Medvedev speaks English / Медведев говорит на английском". YouTube. Retrieved 21 July 2017. ^ (in English) "Medvedev signs landmark anti-corruption law". sputniknews.com. Retrieved 5 April 2017. ^ (in English) "Medvedev: Poverty and corruption are Russia's challenges". Russia Today on youtube.com. Retrieved 5 April 2017. ^ (in English) "The Yellow Rubber Duck Is a Potent Protest Symbol". Bloomberg. Retrieved 5 April 2017. ^ (in English) "Medvedev forgets cares of office at £350m estate on the Volga". The Times UK. Retrieved 5 April 2017. ^ (in English) "The dacha of my dreams". Finantial Times. Retrieved 5 April 2017. ^ (in Swedish) "Ny anklagelse från Aleksej Navalnyj: "Premiärminister Medvedev inblandad i korruption"". Yle Nyheter. Retrieved 5 April 2017. ^ (in Russian) "Он вам не Димон". Alexei Navalny on YouTube. Retrieved 5 April 2017. ^ "Corruption claims 'nonsense' - Russian PM Medvedev". ^ (in English) "Russia protests: Opposition leader Navalny and hundreds of others held". BBC Nred. Retrieved 27 March 2017. ^ "Russian Polls Do Mean Something After All". Bloomberg. 26 April 2017. ^ (in Russian) Законы РФ / Федеральный закон от 27 июля 2004 г. N 79-ФЗ "О государственной гражданской службе Российской Федерации" (с изменениями от 2 февраля 2006 г., 2 марта, 12 апреля, 1 декабря 2007 г.) Archived 4 February 2008 at the Wayback Machine, Garant Database of Laws with Commentary. ^ Muratov, Dmitry (15 April 2009). "Декларация Медведева. Год 2009 (Interview with Dmitri Medvedev)". Novaya Gazeta N39 (in Russian). Archived from the original on 16 April 2009. Retrieved 15 April 2009. Viktor Stepanovich Chernomyrdin was a Russian politician. 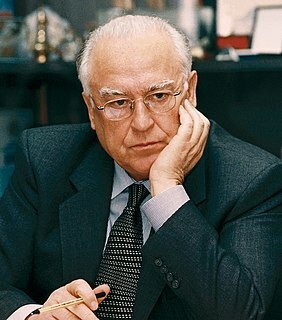 He was the first chairman of the Gazprom energy company and the longest-serving Prime Minister of Russia (1992–1998) based on consecutive years. He was a key figure in Russian politics in the 1990s, and a participant in the transition from a planned to a market economy. From 2001 to 2009, he was Russia's ambassador to Ukraine. After that he was designated as a presidential adviser. Alexei Leonidovich Kudrin is a Russian liberal politician serving as the 4th and current Chairman of the Accounts Chamber since 2018. Previously he served in the government of Russia as Minister of Finance from 18 May 2000 to 26 September 2011. After graduating with degrees in finance and economics, Kudrin worked in the administration of Saint Petersburg's liberal Mayor Anatoly Sobchak. In 1996 he started working in the Presidential Administration of Boris Yeltsin. He was appointed as Finance Minister on 28 May 2000 and held the post for 11 years, making him the longest-serving Finance Minister in post-Soviet Russia. In addition, he was Deputy Prime Minister in 2000–2004 and again beginning in 2007. As Finance Minister, Kudrin was widely credited with prudent fiscal management, commitment to tax and budget reform and championing the free market.